Everybody loves a deal, don’t they? Do enough folks love Starbucks coffee to help grow Foursquare’s audience? There was a great deal of buzz online yesterday about Starbucks announcing plans to offer the Foursquare mayors of their various locations discounts on coffee drinks (among other things) nationwide. I think it would be safe to say that there are some one or two-person coffee shops already using Foursquare as a way to communicate with their tech-savvy regulars. All the announcement really did was make it OK for most people to try it out. Analytical tools being offered to businesses by Foursquare means that as Starbucks customers with smartphones willingly check-in as they arrive, store managers and marketing departments should be able to know a little more about a significant portion of their fans, including gender, time of day they may normally visit, peak times and where they share their message. Big Orange Marketing sums it up best in a post written back when the analytics dashboard was being unveiled. It could mean an additional level of interaction with customers as described in this New York Times blog post talking about the introduction of the analytical tools in March. Talking to customers is nothing new, it’s simply another way to engage them and understand what will pull them in. You’ll have access to a group of individuals that have (hopefully) opted-in to share their location and something about themselves – a useful set of information (particularly if you’re in the midst of an economic restructuring strategy). It is by no means the entire picture, but it can help those looking for a first step – one that makes it a little easier for those asked to analyze the data. It may also provide a way to see if new strategies are working. 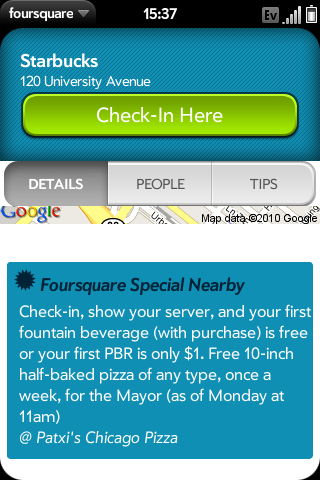 The overall potential of Foursquare to me is endless. It could become a premiere user-generated visitors guide that doubles as a valuable tool for businesses. The only thing that could stand in their way is the emerging specter of privacy concerns (a la Facebook). They seem to be aware of that. If they can provide a real solution for those concerns then the fun part of seeing how many ways we can apply the information collected begins. What does it mean to be a friend nowadays?